This Mercury Ultra High-Speed Polisher/Burnisher is safety enhanced with an interlock switch, which conveniently leaves both hands in control. The safety non-conductive dual triggers eliminate shock potential, and always leave you, the operator, in complete control of the floor polishing machine. The fully adjustable handle makes operating the polisher comfortable for all operators. A flexible pad holder with threaded pad-centering device conforms to floor irregularities and delivers an even shine and gloss across all types of floors. The balanced all metal chassis offers more precise pad pressure and weight for a longer, brighter shine. The separate non-marking transport wheels help to prevent tracking contaminants from job site to job site. The non-marring full wrap bumpers help protect walls and baseboards while polishing your floor. When operating the Mercury polisher, the 1.5HP, D/C rectified motor helps to eliminate brown-outs and low voltage startup torque problems. Reaching under counter coves and beds is not a problem with the low profile drive apron. Make sure to completely sweep and dust mop your floor before burnishing. This will help to ensure you never run the polisher over a sharp object which could be thrown out from underneath the apron, and harm the operator or damage the floor. 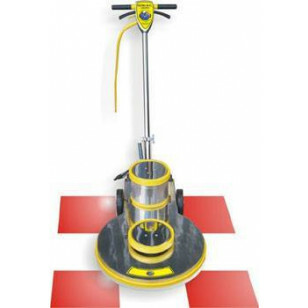 For other floor polishing machine options, take a look at our complete line of electric floor burnisher buffers.